Nifty further corrected today as expected and closed in the vicinity of the crucial support level of 6230. Technically next support is at 6180-40 levels. However a rally in US markets could prevent further downfall in the markets today. Those who have gone short yesterday when 6230 level was broken will panic and there will be short covering based rise for initial trading hour. 6230 also happens to be the 10 day moving average, prompting shorters to carry positional shorts. 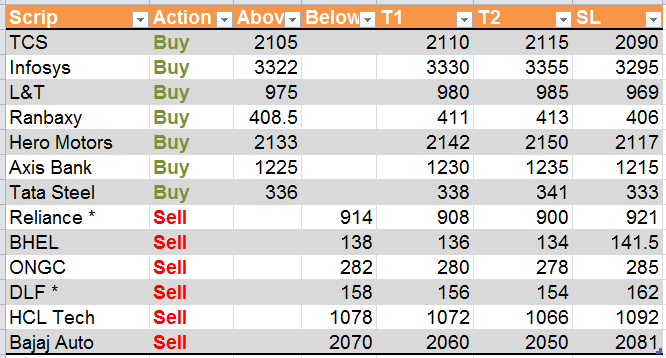 For the trading on Nov 07, exit all longs if 6200 level is broken. Though there exists a support at 6180, this is a weak support and market could slide up to 6140. This is an excellent buying zone for short term traders. On the upper side, rally is US markets could push Nifty up to 6275 levels. 6300 is a solid resistance. This is followed by 6350 resistance. For the markets to remain positive, 6230 must be held. Above 6250, market could touch 6275. 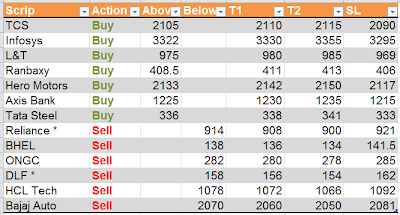 I am giving higher number of calls, since markets could swing any way tomorrow and we need to come out profitable. More calls could get triggered, please filter out based on your risk appetite. * Reliance : Sell if reliance rises above 914 and falls below that level and stays. * DLF; Sell if DLF rises above 158 and falls below that level and stays.